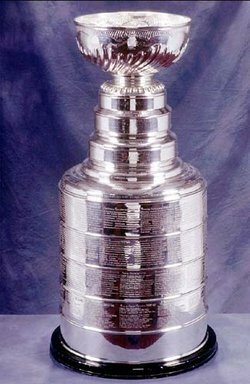 The Stanley Cup, originally a decorative bowl purchased from a London silversmith worth 10 guineas ($48.67 USD), was originally donated in 1892 by Lord Stanley, Governor General of Canada, who had become enamoured with ice hockey. It was originally used as the trophy given out to the top amateur hockey team in Canada, decided by the acceptance of a challenge from another team by the Cup holders and trustees. The Cup also acted as the league championship of the league that the champion belonged in. The Cup was not the property of any given team at any given time. The Cup trustees have the final say on disputes should there be any on who the Cup holder should be. Challengers for the Cup must have won their league championship. The challenge games (where the Cup could change leagues) were to be decided either in one game affair, a two-game total goals affair, or a best of three series, to the benefit of both teams involved. All matches would take place on the home ice of the champions, although specific dates and times would have to be approved by the trustees. Ticket receipts from the challenge games were to be split equally between both teams. A league may not challenge for the Cup twice in one season. The Cup champions have the responsibility to return the Cup in good condition when required by the trustees. The Cup champions could add a silver ring to the Cup to commemorate their Cup victory. The Cup has been awarded every year since 1893, except for 1919 (when it was not awarded because of an outbreak of Spanish influenza) and 2005 (as a result of a labour dispute). The Montreal Canadiens have won the most Stanley Cups, twenty-four. The Toronto Maple Leafs come in second with 13 Cup wins. The highest-ranking American team is the Detroit Red Wings with 10 wins. In December 2004, a group of hockey fans from Edmonton announced their intention to ask the trophy's trustees to make the Stanley Cup a challenge trophy once again due to the 2004-05 NHL lockout. Their plan involved the winner of the Memorial Cup, Allan Cup, University Cup, as well as the top Canadian minor professional teams (AHL and ECHL). The Cup's current Trustees, Scotty Morrison and Brian O'Neill (both former longtime NHL officials), made no formal ruling, but were quoted as saying that the NHL's possession of the Cup is firm. There are actually three Stanley Cups; the original bowl, which is displayed in a vault at the Hockey Hall of Fame in Toronto, Ontario; a duplicate, made by Montreal silversmith Carl Petersen, which is the one awarded to the champions of the playoffs and is also used for promotions; and a replica that is occasionally on display at the Hockey Hall of Fame when the duplicate is travelling. It currently stands at 880 mm (35.2 inches) tall and weighs almost 14.6 kilograms (36 lb 8 oz). To have one's name inscribed on the Stanley Cup, a player must have played at least 41 games for the team during the regular season (provided the player remains with the team when they win the Cup) or a game of the Finals, although the NHL will also permit other reasons on a case-by-case basis. The player who has served on the most Stanley Cup championship teams is Henri "The Rocket" Richard, of the Montreal Canadiens, holder of 11 Stanley Cup Rings. Two other Canadiens have 10 rings: Jean Beliveau and Yvan Cournoyer.